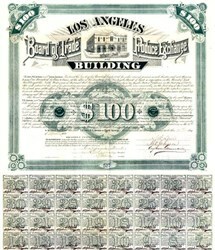 Beautiful uncancelled $100 bearer bond certificate from the Los Angeles Board of Trade and Produce Exchange Building issued in 1889. 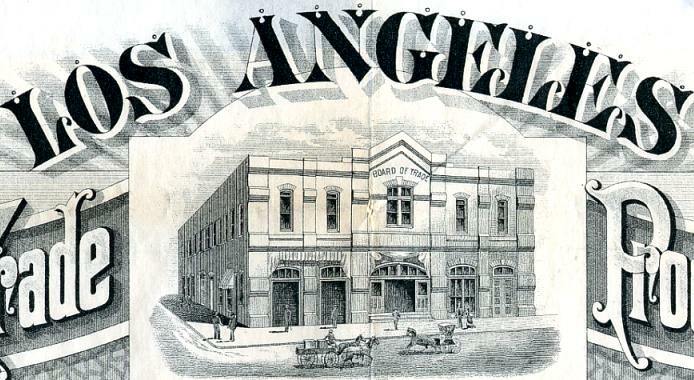 This historic document was printed by the Los Angeles Lithigraphic Company and has an ornate border around it with a vignette of the Board of Trade Building with a horse driven carriage passing by. This item has the signatures of the Company�s Trustees S. B. Lewis, M. D. Johnson and Eugene Germain. It was also signed by the Officers of California Bank as Trustee, H. G. Newhall as President and T. J. Weldon as Secretary. We beleive this bond to be quite scarce. Eugene Germain, a native of Switzerland who had arrived in the city via the Isthmus of Panama in 1870, was the founder of the Germain Fruit Company which handled wines, nursery stock and seeds and operated a fruit packing plant. Germain became the first president of the Los Angeles Board of Trade, organized in 1883, and served two terms in the capacity. He was one of the first Vice-Presidents of the Los Angeles Chamber of Commerce and President of the Stock and Produce Exchange of Los Angeles. An active and respected participant in the city's social and fraternal life, Germain served as Treasurer of the Los Angeles Masonic Lodge No. 42 in the 1890s, belonged to the Odd Fellows and the Jonathan Club and was a charter member of the California Club. In 1893 Germain was appointed by President Grover Cleveland for a four-year term as United States Consul at Zurich, Switzerland. Eugene Meyer was the Consular Agent for France in Southern California and was succeeded by Leon Loeb, another French-born Los Angeles Jew.